Published in Permaculture Activist, Issue #87, February 2013. As a former seismologist who has taken many field trips to measure aftershocks, I (Emet) have seen how difficult earthquake survivors’ lives can be. Currently, I’m a permaculture designer and teacher. After the deadly earthquake in Van, Turkey on Oct. 23, 2011, I issued a call to the permaculture-related groups in Turkey. It took us seven months to become organized and complete the assessment of local needs, and match those needs with the available skill set. Also, some team members were living abroad when the earthquake occurred. Our group, consisting of one instructor, two new permaculture designers including Yeliz and one amateur documentary maker, delivered a permaculture aid program to the survivors over five days in July 2012. Our budget from small individual donations was less than US$1000. We didn’t want any funding from institutions because aid distribution is often corrupted following earthquakes and other natural disasters. Also, the area, which is predominantly Kurdish speaking, was quite politicized. We decided to keep the project independent and not to be manipulated by any groups in any way. The project that we implemented included a winter vegetable garden built and planted with hugelkultur technique, biochar stove and solar oven construction, seed sprouting, vertical gardens, food-forest establishment techniques, herb spiral, hot composting, and a grey-water treatment. Ercis was the epicenter of the earthquake. One-third of the town was destroyed, and more than 500 hundred people died, with many wounded. We named the project the Van-Ercis Post-Disaster Ecological Restoration Permaculture Project. With the motto, “From Absence to Abundance,” we aimed to eliminate the negative influence of the words such as disaster and earthquake and to show how much we can do with the things that are called waste without realizing its value. A five-day intensive hands-on project was held in our host Ceylan’s extended family’s courtyard garden, and we also used the Technical High School in Ercis for the biochar stove and solar oven workshops. The eldest of the family, a 78-year-old grandmother, has been living in this location with her three children, three daughters-in-law and eight grandchildren in different houses. While walking through the streets of Ercis, we witnessed the wreckage and cracked buildings of empty houses and workplaces at every corner, although most of the debris had been cleared. Like a movie scene, this disaster was first-hand reality for Ceylan’s family. The local people we met in Ercis instantly started telling their memories of the earthquake without even being asked, demonstrating how people are still traumatized. They kept telling about where they were and what they felt when the earthquake occurred, showed videos recorded at the moment by their cell phones. It seemed as if another wound is inflicted at any moment. Asuman, who is the mother of our host family during the project, lost almost all of her biological family members in the earthquake. She and her three sons were hardly able to speak despite getting psychological treatment in the last seven months. When we first arrived in Ercis to assess the situation on the ground, we realized that our original program wasn’t going to cover the local people’s emergency needs. We modified our plans accordingly. For instance, after noticing dirt and smell at a corner of the garden where the children play because of the grey water coming from one of the houses, we decided to include a grey-water treatment in the program. Also, there was a wonderful fruit orchard in the garden, but all the bee hives had been destroyed. There was no money or time to replace them on this visit. Therefore, we decided to show how the orchard can be transitioned to a food forest, beginning with comfrey under the fruit trees and cover crops planted along swales. Likewise, we showed how to produce sprouts from seeds that are suitable to their taste, in order to increase nutritional value of the foods, which is especially important in times of scarcity. We foraged in the fields around the town to collect some endemic species to create a special herb garden, because we heard that most of the herb species for their special cheese, Van otlu peyniri, were almost extinct due to careless harvesting for the market economy. These herbs are also used for medicinal purposes and first aid. Another point is that when we went there to assess the locals’ needs before the workshop, we noticed that some women could not speak Turkish. In response, we created a Kurdish program poster, and found an interpreter for the workshops. We opened the circle using couple of Kurdish words we were learning from the locals every morning. During the project, instead of showing only how to apply techniques, we made an effort to share the idea of permaculture design by explaining every technique’s benefits in holistic design. For example, we explained to our participants how we positioned hugelkultur in the garden, the function of layering, why the herb spiral is important, how we can harvest sun and water using low-tech approaches, and how to sprout seeds to increase their nutritional value. Moreover, as soon as we arrived there, we guided our host family to collect the organic matter coming from their kitchens and shared the reasons for recycling kitchen wastes. We sometimes asked for rotten foods from markets. All these were elements that helped our participants adopt the main idea of our project. Looking at what we called waste in another way and therefore being self-sufficient instead of being dependent, were the things that we could naturally narrate to our participants, our hosting family, the women, and the children in the family. Our participant range was diverse—students and lecturers from Ercis Vocational Institution and Centennial University of Van, farmers, those who wanted to learn greenhouse growing or who wanted to do gardening in their private gardens, people from the agriculture department of the municipality, and even two prisoners from an open prison. Additionally, the children were active from the very beginning until the end. They worked with us when we were sowing seeds, preparing the soil mixture for plastering a giant herb spiral, and the like. We opened our first day of the project with a circle and let our 78-year-old grandmother lead us with her wisdom. We continued this pattern on the following days. In the circles, we asked the participants to introduce themselves in the way they were most comfortable. During our learning sessions, we were attentive to their contributions. We learned about the use of endemic plants in the local diet. We cooked our dinner together every day. We offered free lunch to the participants, ranging from 20 to 35 every day, showing clearly that we were there to share our knowledge and to create something together rather than take something out. This is why our project was also successful in terms of social influences. Above all, having women and children involved in the project made them contemplate themselves and their needs in life from another point. Sevgi, who documented the project with her partner Yasar shared her perspective. 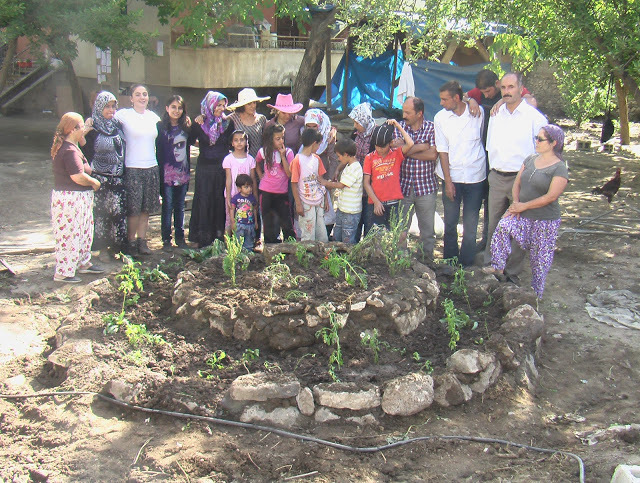 The Van-Ercis project was the first project where permaculture has been used for aid in Turkey. We hope this first step will lead to a permanent permaculture aid group in this earthquake-prone country. Emet explains, “The seeds that we sowed in hugelkultur, greenhouse, and food forest with our children and our elders, are going to grow and spread to other projects too. Something tells me this was just the first step in our country.” Ercis’ experience was a representative project for us of becoming whole with people, land, culture, differences, and despair as permaculturists. Emet Degirmenci completed the Permaculture Design Course in 1997 and has been practicing permaculture around the world. She is the founder of Innermost Gardens in Aotearoa (New Zealand, http://www.innermostgardens.org.nz/ Emet teaches permaculture in her home country Turkey, as well as offers her design services and lectures in Washington (http://nwpcchistory.blogspot.com/). Yeliz Mert is a permaculture trainee and masters student in Sustainable Territorial Development, currently in Italy, where she visits ecovillages and permaculture sites. She is committed to work and contribute to a better life and is willing to spend the next few years in learning, experiencing, and practicing permaculture more deeply worldwide. View a photo album of the Ercis project at https://www.facebook.com/media/set/?set=a.10151018840673637.455182.335518878636&type=3 and videos at http://www.youtube.com/watch?v=ghU36eQP3Fc and http://www.youtube.com/watch?v=DSRaKwyZ18A&feature=youtu.be.